Napa, Calif.—Brian Phillips, director of wine strategy for Darden Restaurants, says wineries better be sure their product is of consistent quality and well represented. Otherwise, wine risks losing further market share in the on-premise sector, especially to spirits. Phillips, currently pursuing final certification as a master sommelier, manages the wine program for Darden, which operates more than 1,700 restaurants including Capital Grille, Yard House, LongHorn Steakhouse and Olive Garden restaurants. The company’s total sales in 2017 surpassed $7 billion, he said. 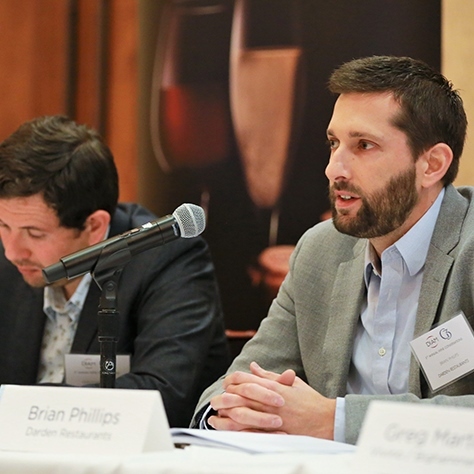 Phillips’ remarks came during a panel discussion that was part of the Fifth Annual Wine Conversations forum hosted earlier this month by French closure supplier Diam, its North American distributor G3 Enterprises and Full Circle Wine Solutions. In addition to Napa, the companies also hosted the event in Paso Robles, Calif., and Newberg, Ore.